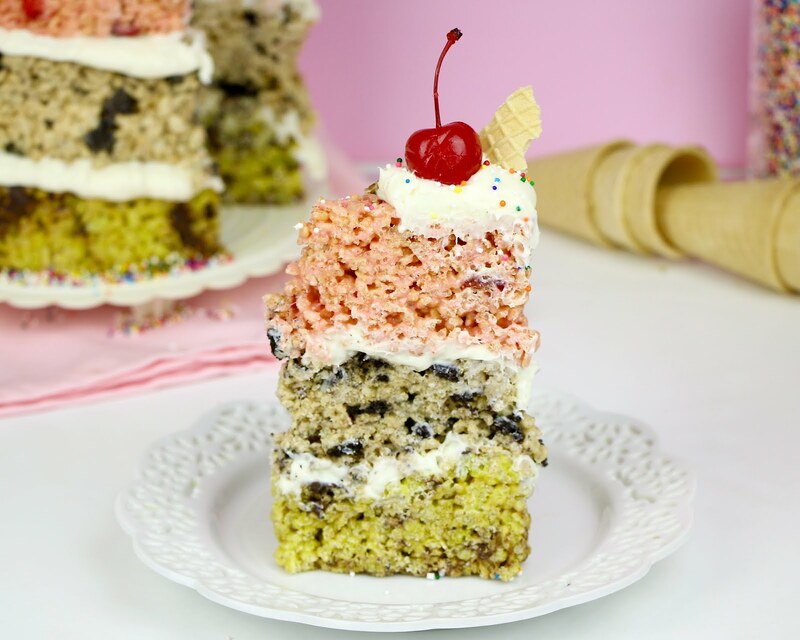 This is the perfect no-bake summer cake made of Rice Krispy Treats, flavored like Ice Cream and stacked into a layer cake! 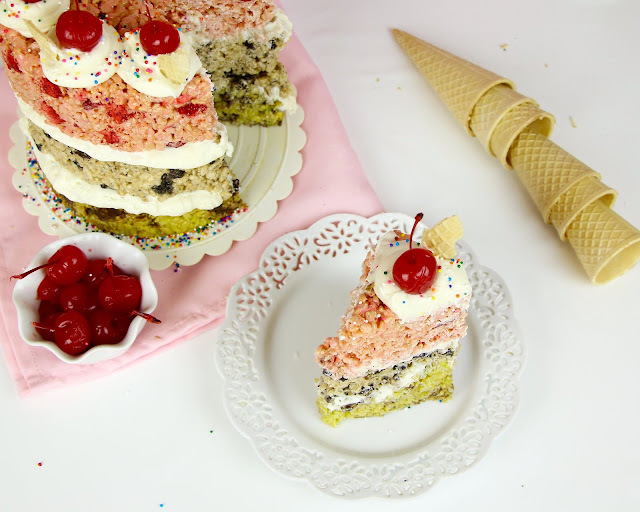 You guys totally love my no-bake recipes, so I thought I would do a fun summer ice cream cake that doesn't melt and that you don't need to turn on the oven for, and how cool did it turn out?! 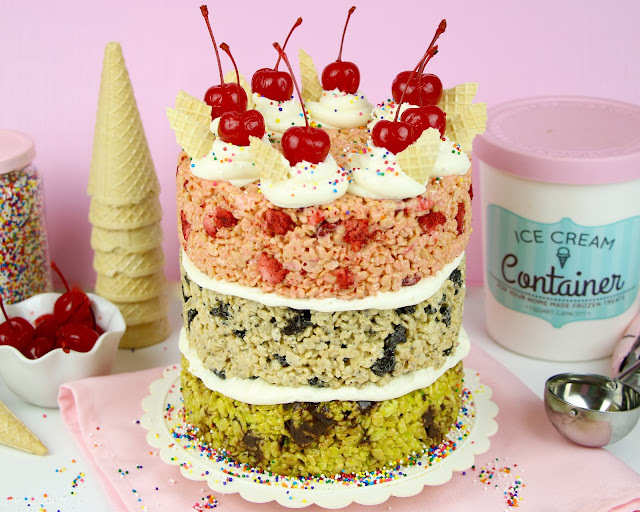 This cake is made of 3 layers of rice krispies treats that are actually flavored to taste like Mint Chip, Cookies & Cream and Strawberry ice cream, all finished off with ice cream cone pieces and cherries, of course! 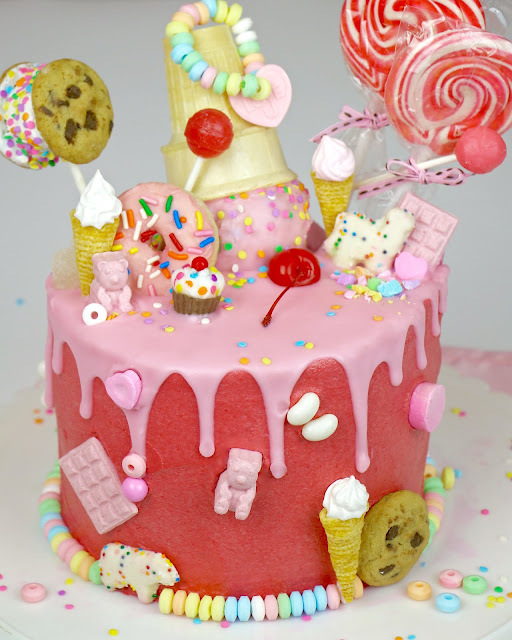 Not only is this the most fun summer cake ever. It's actually a really easy alternative to a regular cake, since there'e no baking required and you can whip it together really quickly. 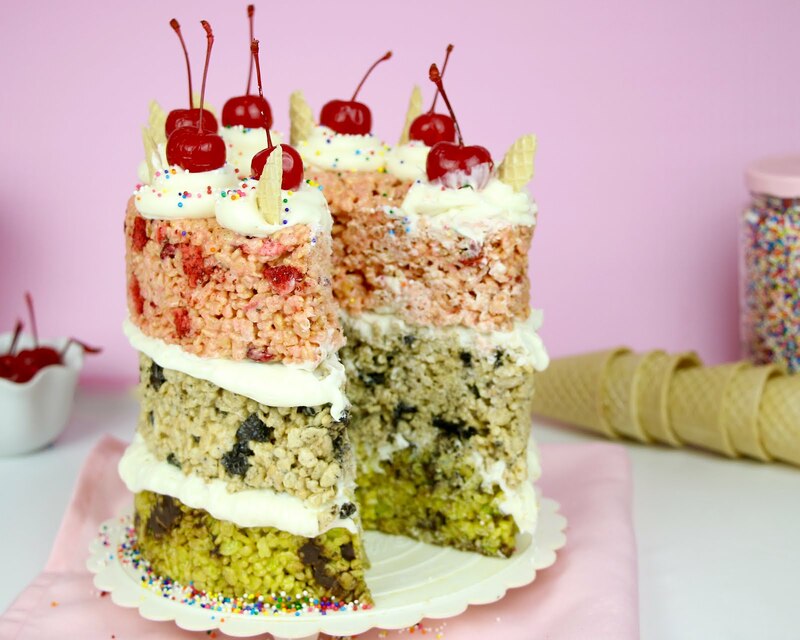 The best part is, you can get creative and make any ice cream flavor treats you want to really customize it! 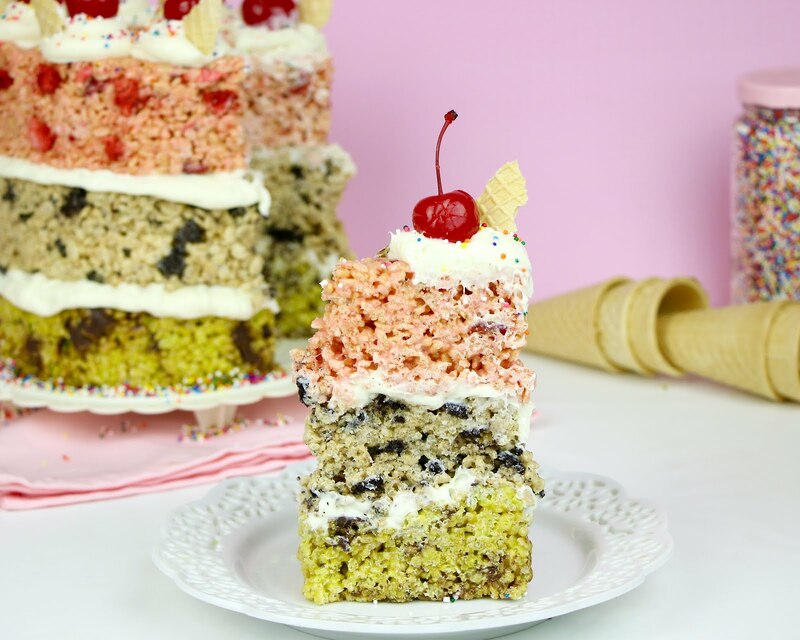 You totally get the ice cream flavor taste of each layer, but in krispy treat form, which is so cool. The best part is, you can just eat it with your hands, so it's perfect for parties and really fun for kids. 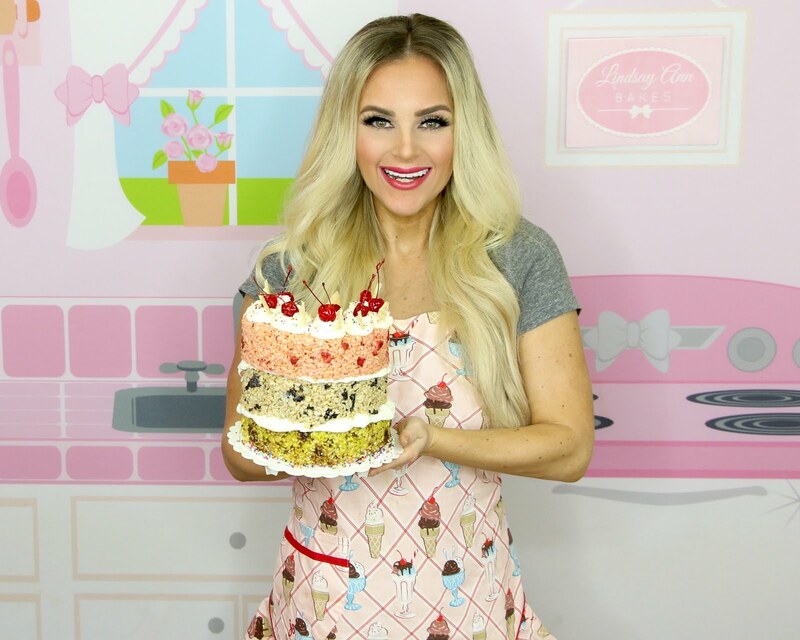 If you give it a try, tag me @LindsayAnnBakes! 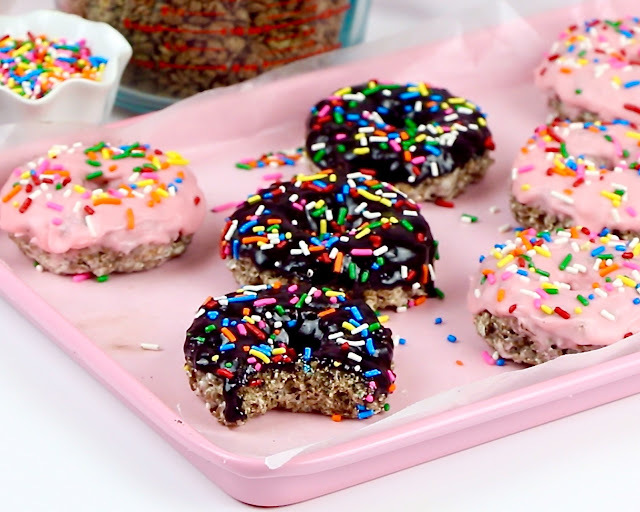 ... or my krispies treat donuts, so be sure to check those videos out too! Line three 6-inch round cake pans with plastic wrap and spray with non-stick cooking spray. Melt butter over low heat in a large saucepan. Stir in marshmallows, until fully melted, about 6-10 minutes. Turn off heat and stir in mint extract and food coloring. 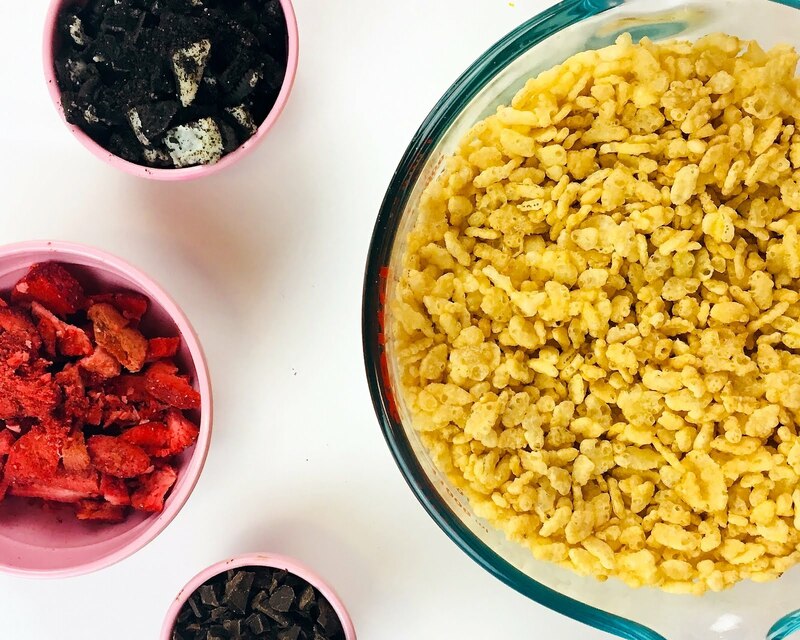 Pour over cereal in a large bowl, mixing until cereal is well coated. Let cool slightly (enough so the chocolate doesn't melt) and fold in chopped chocolate. Pour mixture into a prepared pan, pressing down with greased hands or spatula until flat and level, making sure it gets into the corners of the pan. Let cool until set, at least 30 minutes in the pan. Melt butter over low heat in a large saucepan. Stir in marshmallows, until fully melted, about 6-10 minutes. Turn off heat and stir in vanilla extract. Pour over cereal in a large bowl, mixing until cereal is well coated. Let cool slightly and fold in chopped cookies. Pour mixture into a prepared pan, pressing down with greased hands or spatula until flat and level, making sure it gets into the corners of the pan. Let cool until set, at least 30 minutes in the pan. Melt butter over low heat in a large saucepan. Stir in marshmallows, until fully melted, about 6-10 minutes. Turn off heat and stir in jello powder. Pour over cereal in a large bowl, mixing until cereal is well coated. Let cool slightly and fold in chopped freeze-dried strawberries. Pour mixture into a prepared pan, pressing down with greased hands or spatula until flat and level, making sure it gets into the corners of the pan. Let cool until set, at least 30 minutes in the pan. Place mint crispy cake layer on a serving plate and spread a layer of frosting on top. Repeat with cookies & cream layer. Place strawberry layer on top, with flat bottom facing up. Top with 8 swirls of frosting, using a piping bag fitted with a round tip. 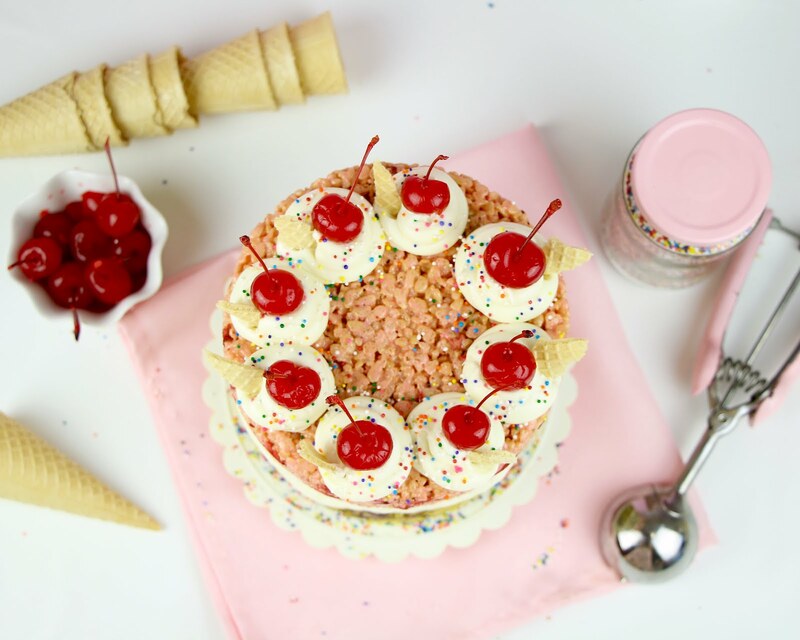 Garnish with a sugar cone piece, sprinkles and a cherry. Store at room temperature in an airtight container for 2-3 days.